Deep vein thrombosis (DVT) is a condition in which a blood clot (thrombus) forms in one or more of the deep veins, usually in the legs. Blood clots can break free and travel with blood causing life-threatening condition like pulmonary embolism (PE) or a stroke due to paradoxical embolism in people with patent foramen ovale (PFO). DVT is not related to diving, but divers often travel and thus are exposed to risk of DVT. In case of acute DVT, divers must not dive. Swelling in the affected leg, ankle and foot. Pain in calf that spreads to the ankle and foot. Skin color change to pale, red or blue. Most air travel-related venous thromboembolism (VTE) occurs within the first two weeks after the flight and resolves within eight weeks. Many cases of DVT are asymptomatic and resolve spontaneously. However, in about 25 percent of cases, untreated DVT of the calf can spread upwards into the veins of the thigh and pelvis. If DVT of the thigh and pelvis is left untreated, there is a risk of PE. 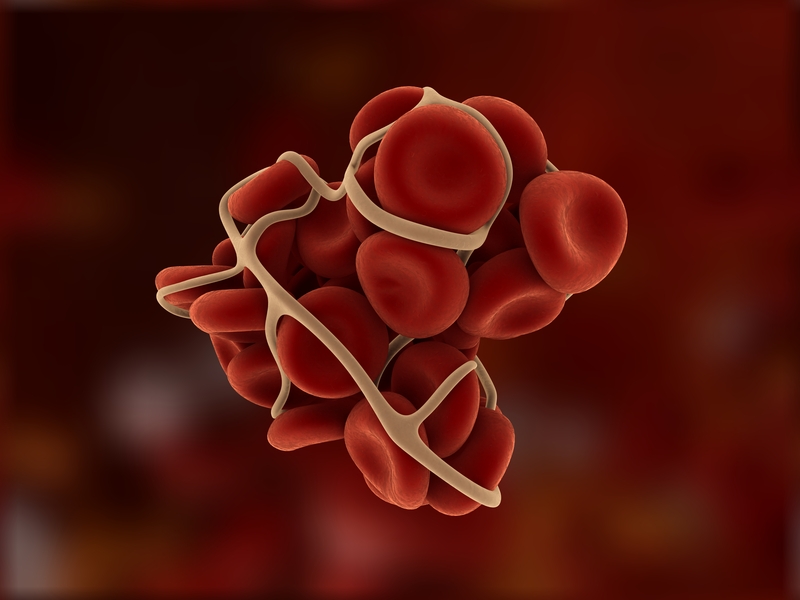 DVT is often recurrent, and frequently, individuals who have experienced DVT endure long-term complications, such as postthrombotic syndrome or pulmonary hypertension after a PE. Most cases of DVT occur in people with pre-existing DVT risks when sitting still for a long time, such as when traveling long-distance by airplane, car or train, in bedridden patients, and in office workers who sit at their desks long hours. Immobility slows down the blood flow in veins (venous stasis) and pressure exerted on the calf region by inadequate seats may injure vein walls. After sitting for 90 minutes the blood flow in the calf drops by half and this increases the chances of developing a blood clot twofold. For every hour spent sitting, the risk of a blood clot increases by 10 percent. Most individuals who developed travel-related VTE (75–99.5 percent) of those have more than one preexisting risk factor. Short (height <1.6 m; 5 ft, 3 in) and very tall (height >1.9 m; 6 ft, 3 in) air passengers appear to be at an additional risk due to fixed seats, which cannot be adjusted to their height. In addition to immobility, shorter passengers may experience seat-edge pressure to their knee back and taller passengers are cramped due to insufficient leg room, which contributes to possible injury of deep veins, stasis of blood and activation of clotting mechanisms. Pulmonary embolism is an emergency and patients need to get to the emergency room immediately. In diving situations, the diagnosis may be confused with dive-related injuries. In remote locations, an emergency medical evacuation may be needed. Paradoxical embolism is called a condition in which a travelling blood clot passes to the arterial circulation instead of being lodged or filtered out in pulmonary circulation. This may occur in cases where there is a direct communication in the heart between right and left chambers (intracardiac shunt) enabling venous blood to pass to the arterial side. The most common form of intra-cardiac shunt is a PFO. Paradoxical embolism of circulation in the brain may cause stroke. The symptoms of postphlebitic syndrome may not occur until a few years after DVT. Treatment options include medications, such as aspirin or diuretics, as well as the use of compression stockings. Anticoagulants (popularly called blood thinners): These drugs decrease blood’s ability to clot. They can prevent growing of the clots or reduce your risk of developing new clots. Filters: In patients who can’t take anticoagulants, who have recurrence of DVT despite use of anticoagulants, or who have repeated PE, a filter may be inserted into the vena cava in the path of venous blood from legs. This filter prevents clots that break loose from lodging in the lungs. The filters are sometimes referred to as umbrellas, because they look like the wire spokes of an umbrella. Although patients with vena cava filters may return to normal life, the reasons for filter implantations should preclude them from diving. Compression socks and stockings: These help prevent swelling associated with DVT. The compression socks are knee high and stockings are thigh high. The pressure they exert helps reduce the chances that blood will pool and clot. It is usually advised to wear these stockings for at least up to a year after DVT. Risk of DVT for healthy people is small. People who have a predisposition to blood clots because of existing medical conditions are at an increased risk for developing DVT when flying. They should wear compression socks and consult their primary care providers regarding possible benefits from medications like aspirin. There is no evidence that healthy people without risks for DVT would benefit from compression stockings and aspirin. Everyone should avoid long periods of immobility; it is good practice to periodically get up and walk around. It also helps to exercise feet and calf while in seat to stay well hydrated. Divers should not dive during the acute phase of DVT and while taking anticoagulants. Return to diving after DVT is possible, but the evaluation should be done on an individual basis. Return to diving after pulmonary embolism probably is less likely, but may be approved by physician if recovery is satisfactory and risk of repeated embolism is minimal. Return to diving after stroke should be evaluated on an individual basis. For a referral to a physician near you who is familiar with diving medicine, contact the DAN Medical Information Line at +1-919-684-2948. Add being over 6 feet tall as a risk factor and sitting in the window seat of a plane. I had a DVT after a flight back from Hawaii (first class, which it turns out, is no different in incidence than coach). I am on Coumadin long term (probably had PE prior to trip) and got cleared by Dr. Richard Moon at DAN. I’ve been back to diving two and 1/2 years with no problems. The risk of falling and hitting my head is much greater than any theoretical risk from the blood thinners.